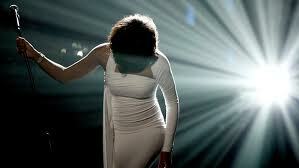 Whitney Houston’s death has affected me in a way I never expected; I’m envious. I thought it was anger that I was feeling, but no; it’s envy. Thirty-five years ago, on February 13th, my mother drank herself to death. She was forty-three. After a weekend of around-the-clock drinking at a sleazy bar on the corner of San Pablo Avenue and University, where her husband was a bartender and therefore had the keys, she suffered a heart attack. Because she was so intoxicated, she couldn’t convey to him that she was in trouble. They had driven down to the Berkeley Marina, possibly to enjoy the sunset. The view would have been west across the shimmering bay that ebbs and flows from the mighty Pacific Ocean. The city lights of San Francisco would have been flickering to the right, and beautiful Mt. Tamalpais would have been in silhouette to the left. Thick, billowing fog may or may not have been tumbling through the Golden Gate. By the time her husband realized that she wasn’t O.K., he drunk-drove across town to Alta Bates Hospital where she was pronounced “Dead on arrival.” Peace be with her. Heart attack or alcohol overdose, it really doesn’t matter. What matters, and what I do battle with even to this day, is that she chose alcohol over everything else. She didn’t just drink one day and die; she drank day after day after day. She chose alcohol over and over again. Why she did that is her business, but she repeatedly poisoned herself until finally her young body said enough is enough. My business is to make sure I don’t do the same thing. Oh, and FYI, in 1948, my maternal grandmother dropped dead off of a bar stool when she was forty-two years old from cirrhosis of the liver. So, “Envy?” you might ask. Yes. Envy surreptitiously gnaws at my resolve to live a different kind of life. I’ve made different choices, but envy tells me that I want what they had: abandon. Oh sweet reckless abandon, checking out, total oblivion, not giving a damn, being free from inhibition, discarding all commitments and responsibilities, unthinking and uncaring. Death is not too high a price to pay; come hither envy calls; you know you want it. I must, must, must remember that I’m vulnerable to this sick seduction. As long as it’s my choice, I choose life over death. Of course I do. Why shouldn’t I? Life is so good. I have nothing to run from when I remember to be honest with myself about the places that hurt and the pain I wish to hide. I have friends who understand this. They are my people, my winners circle. I stay close to them because they save me from my own crazy thinking; they save me from my head that’s out to kill me. My heart goes out to Bobbi Christina, Whitney Houston’s daughter. It will be a miracle if she finds some perspective and is able to rejects those wicked, self-annihilating daemons. I hope she finds a winners circle of her own. I know it’s possible because I’ve done it. I’m forever grateful. Gratitude is what keeps tipping the scale in my favor. I get to remember that it’s up to me to create a life that’s worth waking up for; thank you, thank you. These twelve steps can’t fix my problem, but they help. I think of them as a sieve. I pour myself into them and what comes out is cleaner than what went in. Peace be with us. Have a great week, and I’ll post again next Friday. This entry was posted on Friday, February 17th, 2012 at 9:20 AM	and is filed under Uncategorized. You can follow any responses to this entry through the RSS 2.0 feed. You can leave a response, or trackback from your own site. Thank you for sharing. Life over death — it is our choice. I thank GOD for my winners circle and *Life* is one day at a time. Thank you again — for sharing your heart and hope. Terry – thank you for sharing so much of yourself. I think this is what makes a writer/artist stand out from the crowd – the willingness to expose herself in public. Thank you Rita for this beautiful compliment. Funny, although this blog is a public format, it always feels like home to me, and your regular participation make you feel like a sister. You’re the best! Unfortunately or fortunately I completely identify with your feelings and thoughts. When I think of my history sometimes I feel like a holocaust survivor; there all gone, I’m still here. Thanks for sharing it helps me accept my own humanity and at the same time grows my gratitude for not continuing on the same path. But for the grace of God. Have a wonderful weekend, I miss you. Thank you Marian. Your words warm my heart. It’s unfortunate that we share a history of loss, but I feel so fortunate to have you as part of my winners circle. Love you, Heather. I’m so looking forward to seeing you and your family when you get to Calif. This is so touching. You’re a brave and wonderful being and you need to be just the way you are to move, entertain and inspire us. We think we know people but there’s so much behind that curtain of normalcy we wear day after day. I will be sharing this post with friends. Kalpana, I’m so glad for your friendship and kindness. The “curtain of normalcy” is so fascinating. We all have a story to tell, no? Thank you for sharing my blog link on your Facebook page. I was delighted by all the positive energy your friends sent my way.